It has been a while since Mrs.SF and I went to the cinema. Our vague recollections suggest it was one of the earlier Harry Potter films. As you can probably tell, I am not that keen on the cinema (particularly the big corporates) and in terms of food the less said the better really. Think those awful, desperately sad looking “hot dogs” – ghastly meat sacks containing gawd only knows what processed meat that rotate in perpetuity on those rollers. These really look the worst (as opposed to the wurst) and I have never summed up courage or indeed the desire to try one. I also don’t much like people eating or drinking when I watch a film. Few things are more distracting than the person behind you tucking into a pile of nachos (whoever though up the idea of selling these as a snack to enjoy at the cinema needs shooting) and sucking up the last vestiges of a bucket of cola. If you want diner and a movie, my view is eat before or after, but not during it! Tempting as the Motley Movies offerings are in terms of food, the film they have being showing, in the form of “Grease”, did not appeal. I have seen it more times than I care to remember and, as a result, have no desire to watch it again, let alone pay to do so. I imagine, mind, their screening of the Wales v Ireland 6 Nations game was an absolute blast. Was sold out before I even considered it as a option for watching the game! 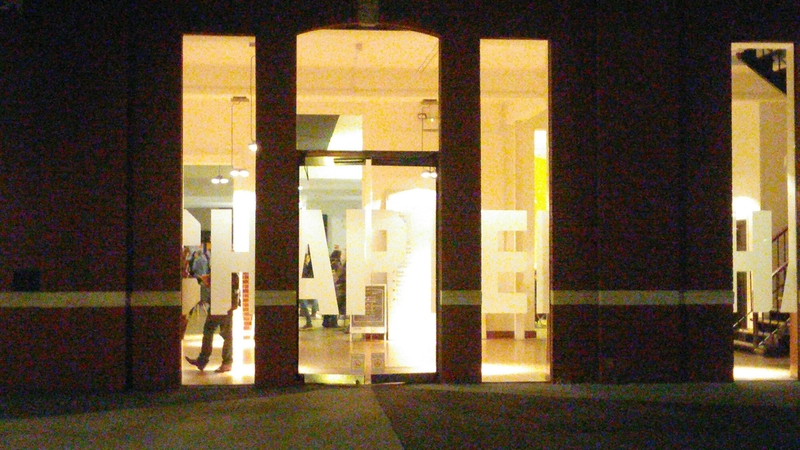 Based on this, we decided to go (the week before) to Chapter Art Centre in Canton, Cardiff. 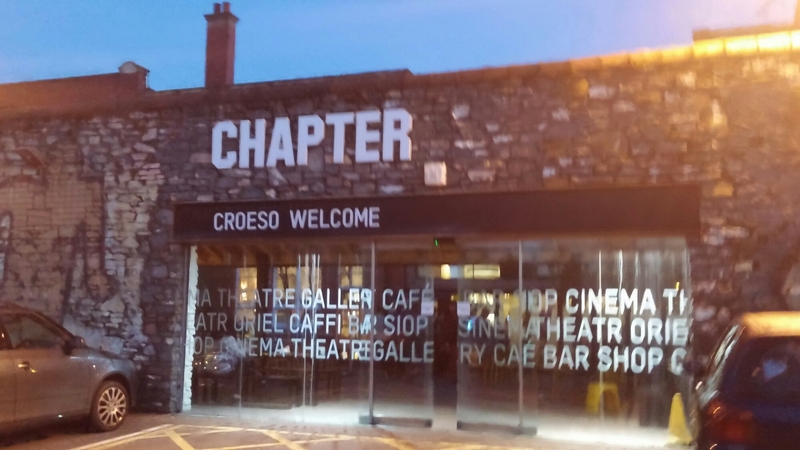 Chapter Art Centre really restores my faith in cinemas, being a lovely local facility (much more than just an independent cinema) and is to me a perfect place to watch a film. We went to see “The Imitation Game” which I would highly recommend and which seemed apt when referring to the standard cinema hot dog – which is a pall imitation of the real thing. Chapter’s policy of no food or drink to be taken into the cinema is one of the many things I like about it. Sweets you can get away with, nachos, coke, 3 course Sunday dinner (seems to me some people would go this far) etc. you can’t. Another, is its bar and food offering – great for a bite to eat and/or a drink before or after your movie (or just skip the movie). 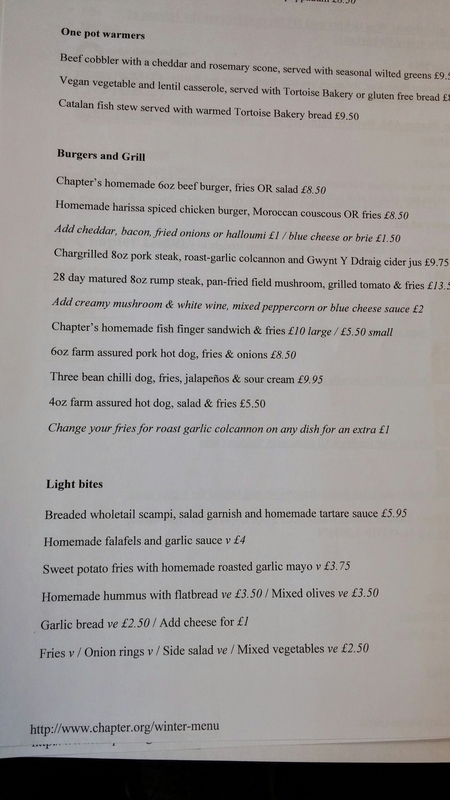 The menu is a nice mix of quick bites, fast food (dogs, burgers and pizzas) and more substantial dishes. It also have a good choice for non meat-eater of both the veggie and vegan persuasion. On the dog/wurst front, there were 3 options – a 4oz, a 6oz and a 6oz chilli dog. All are stated to be farm assured pork. Whilst I wanted the chilli dog, the only one actually available on ordering was the 4oz. 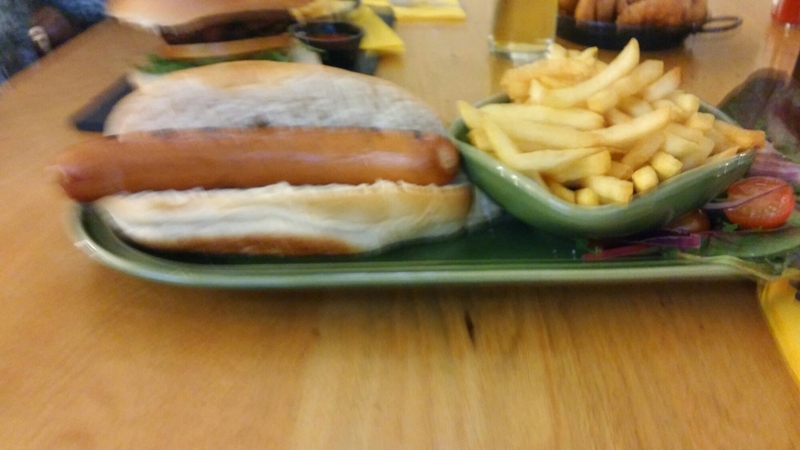 This post’s title wouldn’t make much sense if I didn’t go for a hot dog/wurst, so of course I did – having to settle for the 4oz, with fries and a side salad (£5.50). The dog/wurst had a good snap to it and an excellent meaty flavour as any one worth it’s salt should. It came naked (no onions, kraut or mustard) in a regulation bun. The bun was a bit on the dry side and I would have liked at least a decent smear of mustard on the dog/wurst. It was, however, a million times better than the hot dog abominations on sale at most of the cinemas chains. It came with some nicely crisp fries and a small, but well dressed side salad which made the £5.50 price tag pretty good value in my view. All in all a nice and not insubstantial pre – movie snack. Mrs SF went for the 6oz burger. (£8.50). The burger was cooked medium (no choice was given as to cooking preference), which is how Mrs. SF likes her burgers (it was too done for me). 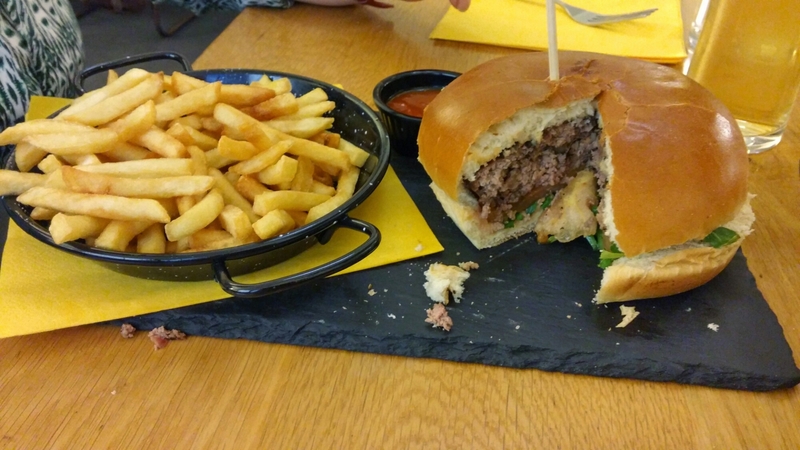 It was a tasty, well seasoned burger with a nice not too dense texture. It looked like it was homemade – which is good, but a little shy of its purported 6oz weight – not so good. Portion control a bit off here. It came, as with my wurst, with fries ( a larger portion than mine) and a chilli dip. Mrs. SF enjoyed it, but I think mine was better value. 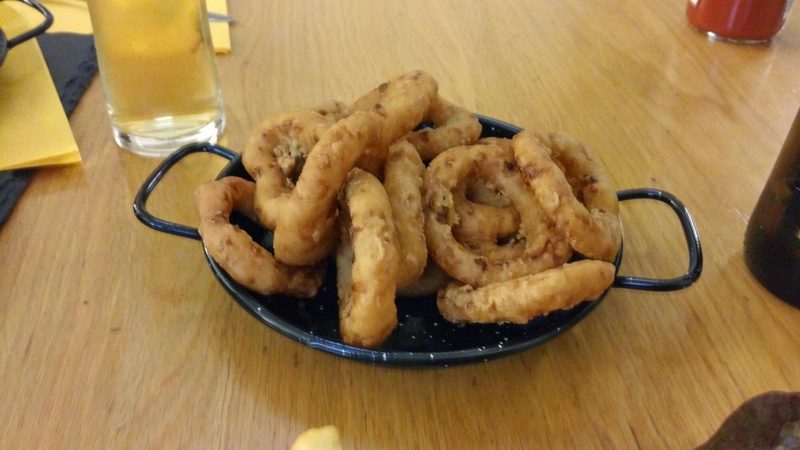 We shared some rather disappointing onion rings (£2.50), with the batter on them being quite dense in texture. 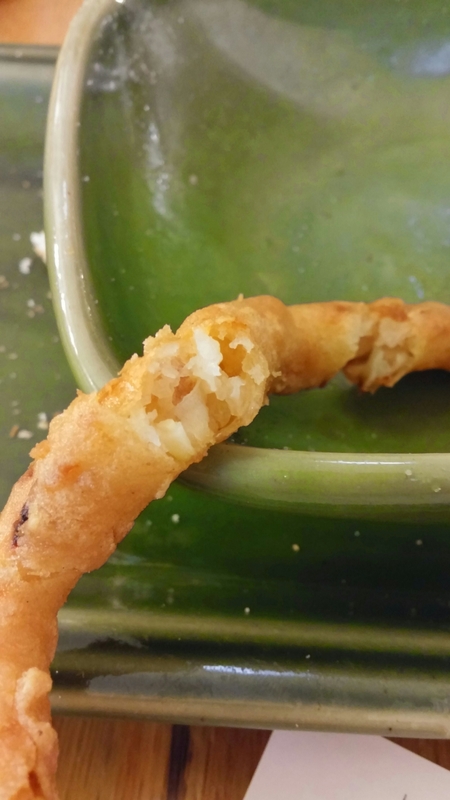 I prefer a light crisp batter on my onion rings and this was neither, being almost Yorkshire pudding like in texture. Chapter has a great lively bar and it was already pretty packed when we arrived at 18.30. They have an interesting selection of British and foreign beers (German ones being particularly prominent) both on tap and in bottles. They also have what looks like a good selection of other drinks (spirits and soft drinks), but I didn’t get to see what was on offer wine wise. 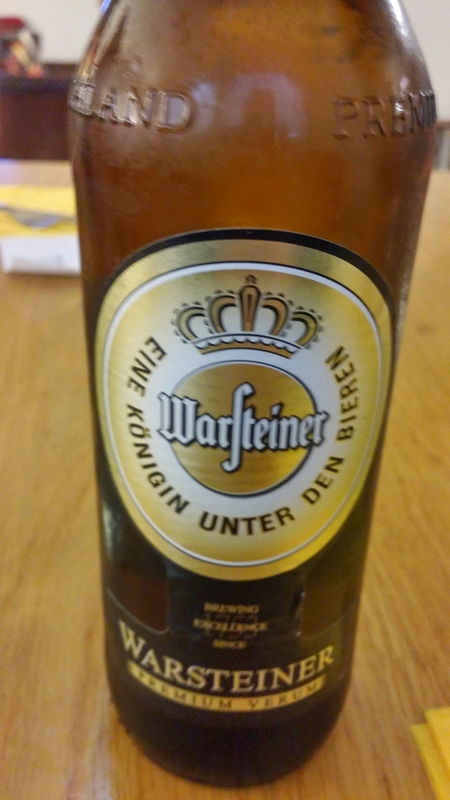 In keeping with the theme of the film we were seeing (the Imitation Game), I started off with a bottle of Warsteiner from Germany. A proper pilsener, it was a nice beer and a good match for the wurst. 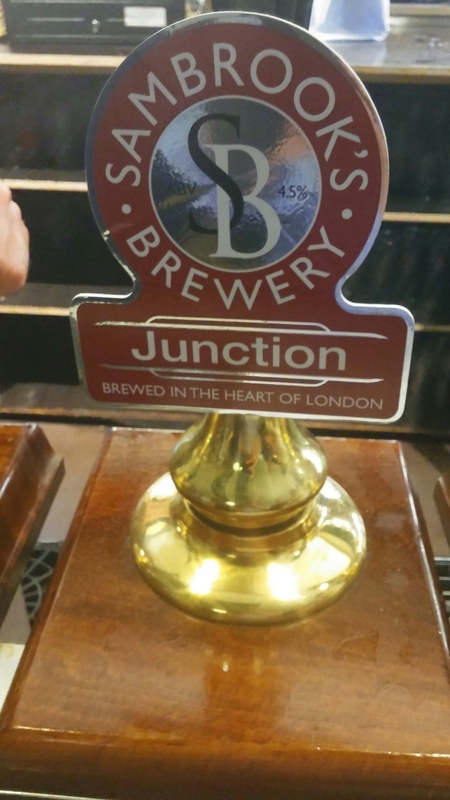 I followed this up with a lovely pint of good old British beer, in the form of “Junction” from the London based Sambrook’s Brewery (on as part of Chapter’s London Ale & Gin week on the week in question). I really enjoyed this beer, which had a lovely, slightly spiced, fruitiness to it. Definitely a win for Blighty on the beer front to my mind. Many years ago Mrs.SF and I use to live only a couple of street across from Chapter and were regular visitors. Since moving further out, we have slightly neglected it and I had forgotten how much I liked it. This will be rectified going forward, as it really is a great asset to Canton and Cardiff as a whole. 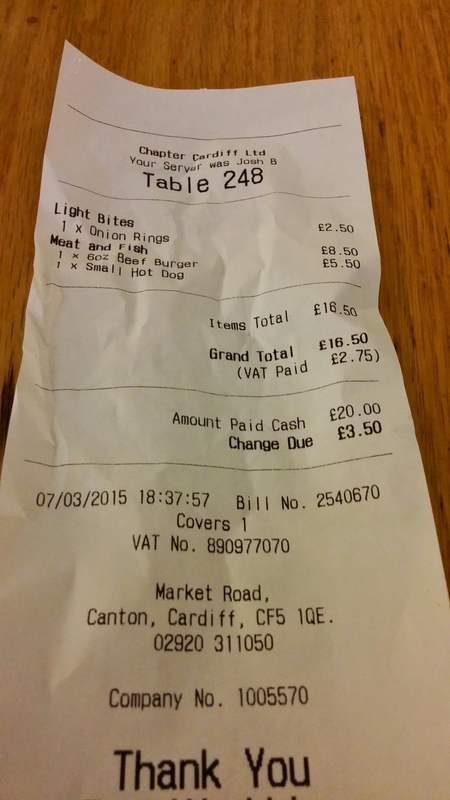 The damage for the food was a pleasing £16.50. Add to this the cinema tickets (£7.20 each + a voluntary 50p donation) and drinks and the all in price for two of us came in at about £40. I thought this was pretty good for an evening out for two. 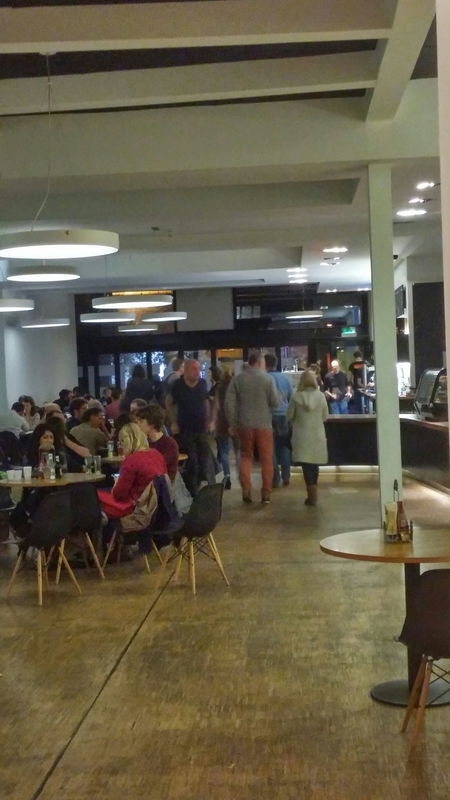 Decent food, good beer and a cosy cinema (amongst other things) sounds pretty darn good to me. You could certainly do “wurst” ( sorry couldn’t help myself). Will I go back? Yep – Mrs. SF l will certainly go to the cinema here more often and will always have some zdrinks and most likely a bite to eat as well, before or after the film. 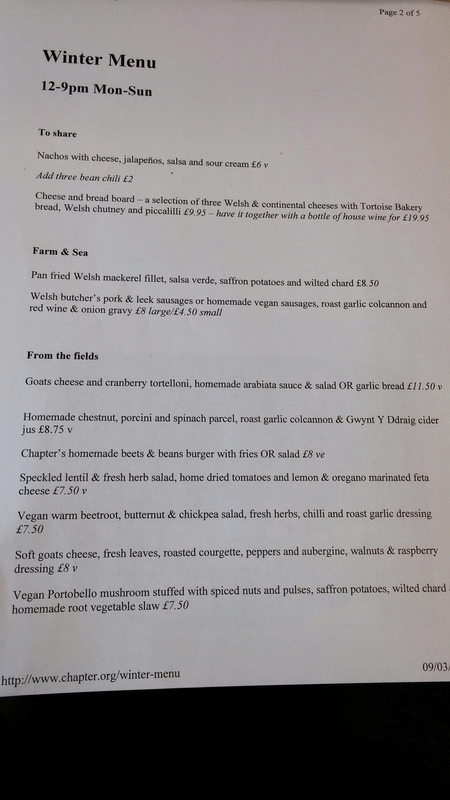 Lunch and dinner: 12-9pm Mon – Sun. Homemade pizzas : 6-10pm Thurs – Sat (eat in or take away). 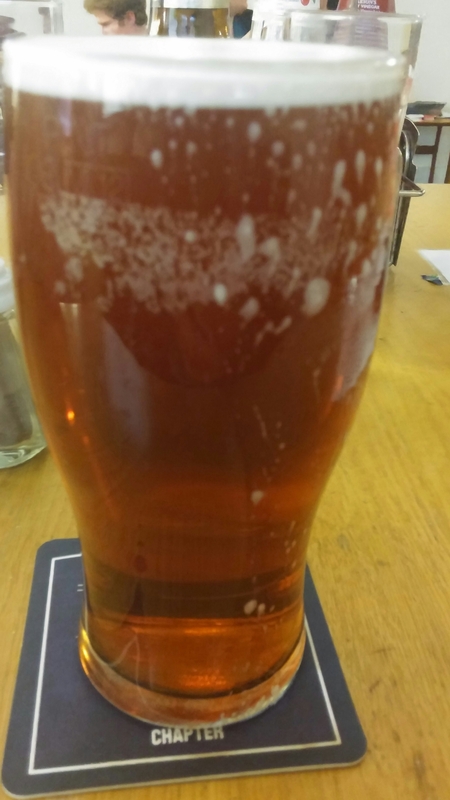 This entry was posted on Mar 15, 2015 by solicitingflavours in Alcoholic drink, Beer, bitter, Burger, Cardiff, Chapter Art Centre, Drink, Food, Food and wine products, hot dogs, Real ale, Uncategorized, Wales.